I have repeatedly declared my love for the Black-throated Blue Warbler. The Cape May Warbler, which I have added to my life list just this spring, is a stunning bird. Speaking of stunning, one of my best bird memories will always be the moment when I spotted a bright male Blackburnian Warbler glowing in the trees above a small pond on my parents’ farm, and another is my first childhood American Redstart flitting out to hawk insects above a stream. It was years later, but no less spectacular, when I finally saw a Cerulean Warbler for the first time in the company of our illustrious Corey Finger. On the other end of the spectrum, the Common Yellowthroat gives me a cozy, familiar, all is right with the world glow, as does the song of the candy-striped Yellow Warbler and the strident call of the confiding Ovenbird. In short, it’s a fool’s errand to try to pick a favorite North American wood warbler, although I am a fool and have gone on that errand before. As I grow older and less foolish, I hesitate to say that the Wilson’s Warbler is now my favorite, but I must admit that I am exceedingly fond of it. They are common enough that I see them yearly, but not so common I grow sated. Their palette is, perhaps, not anything special (at least as far as North America goes – I suspect this is a case where those stuck with European warblers may hate us cause they ain’t us) but the male’s cunning black skull cap is, for want of a better term, cute, and the delicate, sleek aesthetic unity of the bird in any plumage has its own charm. And it’s named Wilson. Wilson is a fine name. 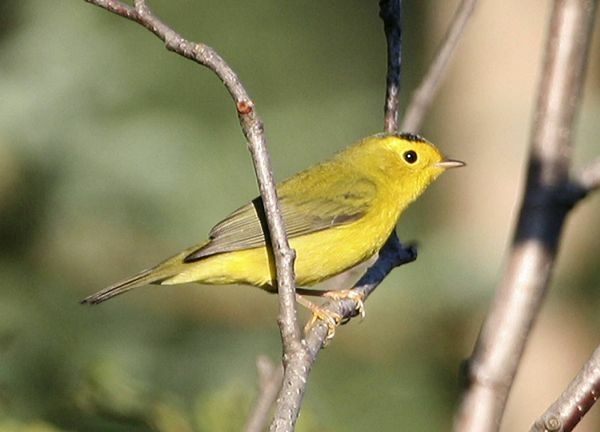 Wilson’s Warbler is, of course, named for Alexander Wilson. Born in Scotland a mere decade before the Revolutionary War, he emigrated to America in his 28th year on the heels of a sentence in gaol for writing anti-capitalist poetry. He had high cheekbones and large eyes, but rock star was not yet available as a career path for angry poetry-writing young men, so instead he became a rock star of American ornithology. In America, Wilson studied birds and painting. He fell in with a birdy crowd, including the naturalist William Bartram, who encouraged his lofty goal of illustrating all of North America’s birds, and George Ord, who accompanied him on collecting expeditions and supported and championed his work. Between his own discoveries (his paintings included 26 species not previously described) and those of his friends, Wilson wound up with not just a namesake warbler but, for a time, an entire genus – Wilsonia, which included the Wilson’s, Canada, and Hooded Warblers before they were split among Setophaga and Cardellina. He is also remembered in the names of Wilson’s Phalarope, Wilson’s Plover, Wilson’s Snipe, and Wilson’s Petrel. He finished eight volumes of his ground-breaking work before he fell into a river while chasing a bird and drowned at the age of 47, which is old for a rock star but terrible to contemplate for a birder. 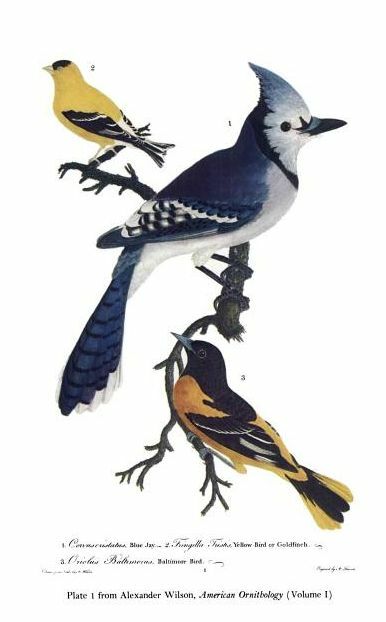 George Ord completed the ninth volume of Wilson’s American Ornithology, provided him with a burial plot, and went on to champion his friend’s legacy, sometimes by throwing shade on that Johnny-come-lately James Audubon. Ord was not at all impartial – Wilson’s paintings got the job done, id-wise, but Audubon was far and away the more fluid and accomplished artist. His is the reputation that survives today when it comes to paintings of birds, and rightfully so. But Wilson still has a warbler, while Audubon only has a subspecies of the Yellow-rumped. They’re very charming birds. I had a surprise Wilson’s Warbler pop into view earlier this week as I was tracking a redstart through a honeysuckle bush. For some reason, that black cap always calls to mind Charlie Chaplin’s mustache. That’s just one reason I enjoy seeing these birds. Everyone knows that the black cap is a yamulke! Nice note about a great bird! But Wilson did not drown. He died of overwork and dysentery in bed in Philadelphia. Where Are You Birding This Fourth Weekend of May 2015?